When historically diabolical sports-transcending actions transpire in your program, your peer institutions may object. That’s unobjectionable — unless of course the peer institutions call themselves the NCAA. If tomorrow it emerges that a staff member at a blue-chip college basketball program has for decades used his position of power and prominence to secretly carry out terrible criminal actions of unimaginable scope and magnitude, I will have no problem whatsoever with the other revenue-sports-playing universities in the vicinity collectively considering — at the conference or national level — whether some form of censure and redress, subordinate to and cognizant of criminal proceedings, might be appropriate. Apparently I’m in the minority. Today the conventional wisdom is that those universities rushed to judgment in 2012 when they reacted to Jerry Sandusky’s crimes by fining Penn State, imposing a postseason ban, taking away some football scholarships, and vacating 14 years’ worth of Joe Paterno’s wins. Reasonable people can differ over whether that was the best blend of sanctions, but what’s being asserted now is the far more sweeping claim that any action at all undertaken by the universities was categorically unwarranted. That strikes me as a novel contention, to say the least. It was on March 31, 2011, that Sara Ganim first reported in the Harrisburg Patriot-News that Sandusky was the subject of a grand jury investigation on charges of sexual assault. Seven months later, on November 10, Paterno was fired, Penn State students went nuts, and Twitter went nuts over the fact that Penn State students were going nuts. 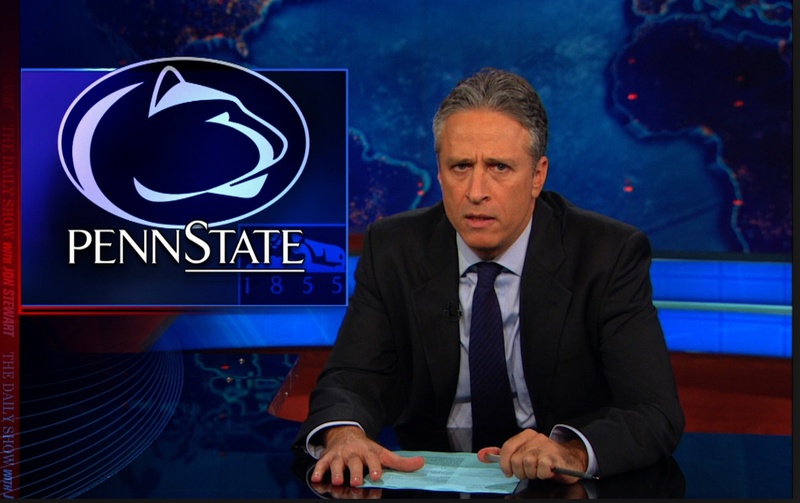 Not until the following summer, on July 23, 2012, did the NCAA announce its consent decree with Penn State. In other words the rush to judgment took nearly a year and a half, which sounds about right for the NCAA. There would of course be subsequent lawsuits from local elected officials — there always are — but those initiatives from selfless public servants acting without the slightest interest in furthering their political careers could wait until after that year’s elections. And in 2013 when Pennsylvania governor Tom Corbett’s pro forma suit against the NCAA was correctly laughed out of federal court in a relative heartbeat, it seemed like this whole thing might finally be staggering toward its long delayed denouement. This is of course a perfectly defensible position (I voiced it too), one that very easily could have prevailed. I can envision a statesperson-like press conference where the NCAA contented itself with merely a bow toward law enforcement, a big donation to the appropriate charitable organizations, and a formal censure of Penn State. But let’s not pretend for a moment that the NCAA wouldn’t have then been absolutely savaged for turning a blind eye to truly criminal behavior. It would have been said that the NCAA cares more about enforcing its absurd bylaws on amateurism than it does about the fact that one of its member programs harbored a predator. Nor do I doubt that the NCAA, eventually, would have been sued silly by attorneys acting on behalf of as many of Sandusky’s victims’ families as they could gather. It didn’t play out that way. For better or worse, the NCAA’s member universities, through the medium of the executive committee, pondered this jurisdictional quandary and deliberated on how best to visit their displeasure on Penn State absent any bylaw spelling out what is permitted in cases where a former staffer uses the program’s facilities to commit felonies. What resulted, by unanimous vote, was the consent decree. No oil painting, surely, but the considered product of a representative body of member schools. You’ll also have to forgive me for not being troubled to find that NCAA staffers questioned whether they were doing the right thing. In fact I would feel far better about the process behind the Freeh Report, for example, if emails surfaced wherein investigators were fretting over whether they were really doing justice to Penn State president Graham Spanier. My worry is precisely that there are no such emails because there were no such qualms. I’ll plead guilty to one count of being a zero-litigation-tolerance meliorist, but at root I’m an optimistic zero-litigation-tolerance meliorist. I honestly believe that someday soon we’ll have a national confederation of revenue-sports-playing universities that is laudably reality-based on blending amateurism with professionalism and even (o, the joy!) on the best way to measure the performance of basketball teams. As recently as this past September the Big Ten’s fine was reaffirmed without any objections being voiced by Penn State, Corman, the Pennsylvania General Assembly, the Common Court, national sportswriters, Twitter, or anyone else. That fine is still in place today. No one is asking or particularly cares if the Big Ten had jurisdiction, if the conference’s authority is dubious, or if the league rushed to judgment. The Big Ten’s actions were functionally identical and precisely contemporaneous to the NCAA’s, but without the “N” and the “C” and the two “A”s there is no story. Funny how that works. The continued prolongation of this whole sad Penn State sideshow accomplishes little or nothing except employing lawyers. This whole sad sideshow has less to do with justice and more to do with an elected official from Penn State’s district predictably using his home-court advantage to twist the NCAA’s tail. The fact that his lawsuit has met with an unpredictable degree of success and has shaken loose some emails provides good spectator sport, surely. But if the emails of people debating the proper course of action in an unprecedented situation are your idea of a scandal, have at it. It is not mine. This entry was posted in florid historical references, in many ways the work of a critic is easy, post-mandatory-amateurism planning, stay off my side on November 12, 2014 by johngasaway.